What does Cadbury and the Premier League have in common you may ask? Well, for one thing, it both sparks joy. Cadbury, the world’s best-selling confectionery brand under Mondelēz International, and leading football authority the Premier League, are extending their partnership to Malaysia. The Premier League partnership that was first announced in the UK last year, builds on Cadbury’s history of iconic sports partnerships including its sponsorship of the London Olympics in 2012. This exciting partnership brings together two iconic global brands that have a unique place within popular culture, and the hearts of people across the world. Malaysia is a football-mad nation, and few would disagree. People shuffle off to ‘mamaks’ with friends or seek the comfort of one’s couches on weekends in the wee hours of the morning just to catch the latest Premier League matches live. 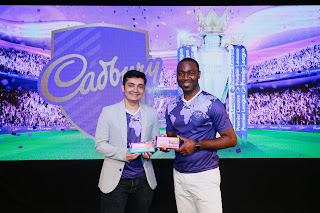 With over 7 million football fans in Malaysia who watch the Premier League, the partnership is set to extend Cadbury’s reach to loyal football fans to deliver a unique experience as the brand shares the cheer and fun of the Premier League match with its consumers. As one of the largest confectionery brands in the world, Cadbury has established a formidable presence in Malaysia over the past four decades. With a strong brand presence, Cadbury has established an unrivalled portfolio of leading products which includes favourites such as Cadbury Dairy Milk and Zip, as well as new and exciting variants such as Cadbury Dairy Milk Oreo, Cadbury 5 Star and Marvellous Creations. With the remarkable growth of the chocolate market in Southeast Asia, Cadbury has experienced a shift in their target market as consumers evolve. Younger consumers not only look for innovative, never-before-tasted products but also a new way of consumption that is intrinsic to the joy and wonderment that chocolate brings. "In today’s world, consumers place their loyalty on the ability of a brand to create new experiences and exciting formats. We see this strategic partnership as a huge opportunity to strengthen brand loyalty and affinity to Cadbury as well as expanding our already large customer base to ensure sustained growth for our business in Malaysia,” added Nikhil. Adding excitement to announcement, English Premier League football legend Andrew Cole, better known to some as Andy Cole, officiated the partnership in a fully immersive launch event during his three-day visit to Kuala Lumpur. A former English professional footballer best known for his time at Manchester United, he has solidified his status as a prolific goal-scoring icon of the Premier League, and the only player who has scored more goals since the league’s launch in 1992. He is the third-highest goalscorer in Premier League history with 187 goals. For more information on Cadbury FC, check out the Facebook page at https://www.facebook.com/CadburyMalaysia.